Bettie Page Gets Unbound This April! January 23, Mt. Laurel, NJ: Everyone's favorite pin-up queen and icon of femininity, Bettie Page, continues her classified adventures this April with a new series from Dynamite Entertainment and a deluxe set of Bettie cards for collectors! Welcome to Bettie Page: Unbound aka the Crisis on Infinite Betties! The Lovecraftian Great Old One Yog-Sothoth has established himself as an inter-dimensional archnemesis for everyone's favorite super model/spy (see the fan favorite Bettie Page Halloween Special!). The monstrous being is opening a dimensional gate to kick off an invasion of Earth, collapsing reality itself in the process. Bettie takes the initiative, as always, to run right into the eye of the storm. Suddenly she finds herself a barbarian queen in the ancient past and will stumble into other multiversal freaky Friday situations. Every Bettie Page issue to this point has been leading to this epic climax. David Avallone (Elvira, Doc Savage: Ring of Fire) brings the whole gang back for this exciting new chapter. Joining their ingenious writer ringleader are artist Julius Ohta (Sherlock Holmes: Vanishing Man), colorist Ellie Wright (Sherlock Holmes: Vanishing Man) and letterer Taylor Esposito (Batman, Aquaman, Elvira). The team cannot wait to continue uncovering Bettie's secret sagas for fans. On the cover art front, Bettie is "unbound" from the attitudes of her time and free to express herself in a way she would surely enjoy - cosplay! The Queen of Curves dons a certain Dynamite flagship hero's iconic chainmail armor for a main cover by John Royle (Project Superpowers, G.I. Joe). 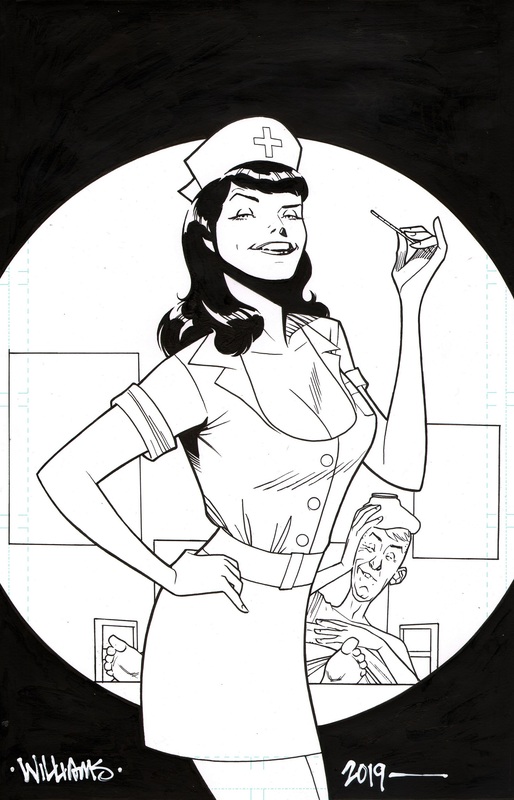 Fans of Bettie and other Dynamite heroines can look out for a Vampirella variant and possibly more... Scott Chantler (Northwest Passage) returns with his cute take on Bettie's timeless appeal as well. David Williams (Justice League of America) and Julius Ohta round out the options. Of course no Bettie Page comic book is complete without photo variants highlighting her incomparable looks and charm. Avallone will not shut up about the new series, so without further ado, here is what he had to say, "I never imagined going quite this 'big' with Bettie… but this 'Crisis' idea sounded like so much fun, I really wanted to write it. Having passed that hurdle, my first question was… do I get to keep my amazing team? And the answer, thankfully, was yes." Proceeding to gush over his team, Avallone said, "Julius Ohta is a dream collaborator: he has a true gift for likeness (his Bettie IS Bettie), a great sense of pace and drama, and he shares my obsession with period detail, costumes, props, settings, etc. On top of all that, the art itself is, objectively, beautiful to look at. Colorist Ellie Wright is relatively new, but I think her work on Bettie so far demonstrates world-class talent and if she’s this good so early in her career I can’t even imagine how astonishing she’ll be down the road. Taylor Esposito is – to quote Warren Ellis just the other day – 'one of the best letterers of his generation' – and I couldn’t agree more. Who am I to argue with Warren?" “Bettie page will not be bound by the human constructs of time and space. Not even a little! She’s going to get out there and give it 110% and make sure there is a multiverse safe for you and me," said editor Kevin Ketner in a far more concise manner. The Bettie Page legacy is coming up on 70 years of inspiring and appealing to men and women alike. The perfect way to celebrate in addition to the new comic series is the Bettie Page Ultra-Premium Deluxe Trading Cards. Bettie's timeless All-American sensuality and playfulness is captured expertly by top of the line artists included in this set including Joseph Michael Linsner, David Williams, John Royle, Scott Chantler and more! Also included are some of the most iconic photographs of the beauty legend. Dynamite will also be bringing in the hottest sketch card artists for one-of-a-kind exclusive pieces. Every individual foil pack includes 2 Base Cards, 2 Sketch Cards, 1 special black & white card, 1 puzzle card, and 1 autographed card. Bettie Page Unbound #1 and the Bettie Page Ultra-Premium Deluxe Trading Cards will be solicited in Diamond Comic Distributors’ February 2019 Previews catalog, the premier source of merchandise for the comic book specialty market, and slated for release in April 2019. Comic book fans are encouraged to preorder copies with their local comic book retailers. It will also be available for individual customer purchase through digital platforms courtesy of Comixology, Kindle, iBooks, Google Play, Dynamite Digital, ComicsPlus, and more!